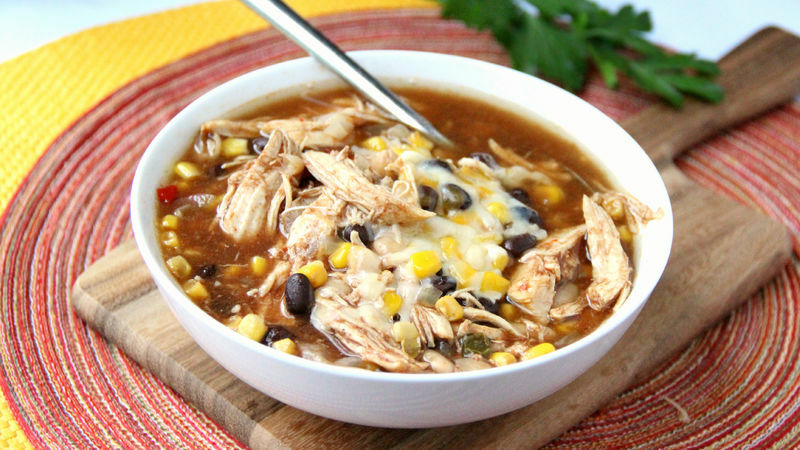 In 6-quart slow cooker, add chicken breast, onion, garlic, corn and white beans. In large bowl, mix broth, barbecue sauce salt and pepper. Pour into slow cooker. Cover; cook on Low heat setting 6 hours. Remove chicken breast from slow cooker, and shred using two forks. Place back into slow cooker. Cover; cook 30 minutes. Serve soup topped with shredded cheese. Don't have white beans on hand? Feel free to substitute black beans or red kidney beans. Got leftovers? Serve this soup over cooked rice to stretch these leftovers for another meal!